It should be painfully obvious that the gun grabbers — including the likes of President Obama, Senator Dianne Feinstein and Vice President Joe Biden, among many others — are not responding to the Newtown, Connecticut school shooting alone, but are using that terrible tragedy to implement a gun control agenda they have long ago planned, waiting for the right timing to achieve their aims. It is a simplification of the problem-reaction-solution formula for control that was formally expressed in the Hegelian Dialectic well over a century ago. It has not only been the unofficial motto of the Obama Administration, but of all the tyrants operating from the Oval Office and around the world for some time. It has been clear for sometime that the Obama Administration planned all along to achieve significant gun control, but planned to do so “under the radar” and in his second, (nearly) unaccountable term, where the President does not face re-election or the worry of alienating voters, when he can essentially act as a dictator without even the need for congressional approval. 1. 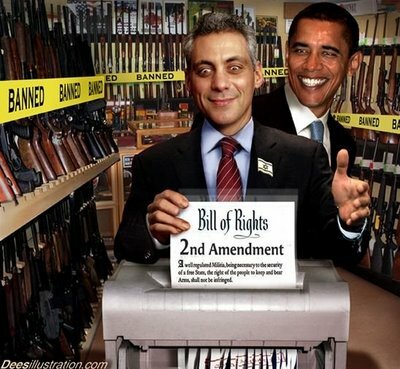 Rahm Emanuel tells Attorney General Eric Holder to STFU on gun control in January 2009, at the start of Obama’s first term. Clearly, the plan was to remain ‘under the radar’ on gun legislation. Revelations about Fast and Furious have become part of an ongoing saga all of its own, but it is abundantly clear that the ATF, the Department of Justice and other agencies willingly “walked” thousands of guns into the hands of Mexican drug cartels early on in the Obama Administration in order to later blame the horrendous effects of the illegal flow of weapons south of the border, and build support for gun restrictions. Investigations in the House have made clear that Attorney General Eric Holder has been less than forthcoming about what and when he knew about the program. During testimony on May 3, 2011, Holder told the Judiciary Committee he had “probably heard about Fast and Furious for the first time over the last few weeks.” CBS News, among others, have produced documents proving Holder was briefed as early as July 2010. Rep. Issa threatened to find Holder in contempt, though no meaningful action has yet taken place. By July of 2011, those new restrictions went into place via policies and regulations at the Bureau of Alcohol, Tobacco and Firearms (ATF). At least one gun store in Albuquerque tried to challenge the new federal requirement that more than 8,000 dealers in Texas, Arizona, California, and New Mexico must report on the sale of multiple semi-automatic weapons. Undoubtedly, the pretext was based upon the government-staged Fast and Furious flow of weapons southbound, but aided by the hysteria over the mass shootings in Tuscon, located in one of the affected border states. The tragic January 8, 2011 shooting in Tuscon, Arizona undoubtedly shocked the nation. Jared Lee Loughner was accused of shooting nineteen people including Congresswoman Gabrielle Giffords, while killing six. While many questions were raised about the alleged killer Loughner, a possible second shooter (or handler) and other unusual aspects of the case, the media and the White House undoubtedly exploited the case immediately to support, if not outright push for, gun control legislation. The day after the shooting, USA Today published an article entitled, ‘Debate on gun control heats up after Giffords shooting’ stating in part: “Gun laws have to be examined,” Rep. Raul Grijalva, D-Ariz., said Sunday on NBC’s Meet the Press. He said that “doesn’t mean denying guns” but reviewing how they become accessible. The likes of the Southern Poverty Law Center and Pima County Sheriff Clarence Dupnik blamed the rhetoric of the ‘radical’ right-wing, while the political establishment overtly called for ‘bipartisanship’ and moves to tone down heated political speech. The post-shooting rhetoric became so shrill that many pundits demonized the mere act of questioning government in the spirit of pulling together in the wake of tragedy, somehow placing collective blame on the entire country for the horrendous actions of one individual. Gun control advocates demanded that Obama use the tragedy to push for new firearms legislation, but the calculating Obama Administration knew it was not the right time for overt moves. President Obama did use a memorial service as a stump speech for re-election and a handy bounce in the polls, but resisted the urge to advocate changes on the 2nd Amendment. This was interpreted at the time to reflect the use of Fast and Furious to steer the gun control debate, but clearly encompasses the coordinated, deliberate exploitation of numerous shooting tragedies, as we have all seen. The Bureau of Alcohol, Tobacco and Firearms attempted to ban the importation of all shotguns that didn’t meet a “sporting purpose.” In doing so, it attempted to block shotguns that hold more than 5 rounds. However, the NRA reported in November of 2011 that this attempt had been blocked in Congress via an appropriations bill for Fiscal Year 2012. The bill prevents the federal government from using any funds to ‘prohibit the importation of shotguns with one or more features disliked by the Agency, such as adjustable stocks, extended magazine tubes, etc.’ as well as from many other actions. However, Ammoland and other Second Amendment advocates point out that the attempt to block the importation of certain shotguns only solidifies the already clear anti-gun agenda of the Obama Administration. The February 26, 2012 shooting of Trayvon Martin sparked a huge controversy over the rights of self defense. While the intentions of Trayvon Martin and the judgement of George Zimmerman may never be fully clear, and the unjustified death of anyone is always a tragedy, the media carried out a deliberate misinformation campaign from the beginning to inflame public debate, agitate lines of racial division and stir the pot for gun control. The primary image of Trayvon Martin shown on television in the wake of the shooting was of a younger Trayvon, heightening the perception of a predatory and targeted killing. Meanwhile, phony racial groups on all sides ramped up the divisive debate over the case– with the new Black Panther party demanding blood on the streets in recorded statements, and false reports of supposed neo-Nazi groups taking to the streets of Florida. The debate technically centered around Florida’s “Stand Your Ground” law, but clearly always had national dimensions. President Obama shamelessly exploited the Trayvon Martin shooting, famously stating that ‘If I had a son, he’d look like Trayvon’, further drawing the identity politics of race into the situation, while one member of Congress wore a hoodie on the floor to decry the shooting. Did he mean to indicate gun control in that statement? While the other cited events exhibit the Obama Administration’s ramped up approach to gun control, the response to the tragic shooting in Aurora, Colorado during the premiere of the Batman film ‘The Dark Knight Rises,’ clearly marked the dawn of Obama’s all out rush for playing public sympathy to achieve his ambitious and unconstitutional agenda. The shooting itself remains mired in troubling unanswered questions, including reports of a second shooting suspect, reports that the theater exit door was opened to let a shooter in, revelations about accused shooter James Holmes’ ties and involvement in mind control research programs, his bizarre behavior while in jail, his unlikely arsenal and much more. But as troubling as the shooting that killed 12 and injured 58 others in Aurora is, the response by the establishment to demand — in a coordinated fashion — that Obama enact gun control as a response to the actions of a supposed lone wolf is more frightening. Meanwhile, many in the media, including NBC’s David Gregory (now calling for gun control in the wake of Newtown), recycled blame on the ‘angry’ political discourse in the country. The media undoubtedly greased the skids for new gun control in the wake of the horrific Batman massacre, giving President Obama the opportunity to refuse action again — as Caesar refused the crown of emperor three times in Shakespeare’s play — before repeated injury gave him no other choice but to take action. President Obama had already been outed as an anti-gun president, after all, he had already been cynically dubbed ‘gun salesman of the year’ after sparking waves of record firearm sales based on fears that he would restrict the Second Amendment during his second term. But his performance during the second televised debate with Mitt Romney left no doubt. Obama openly declared his intention to reinstate an assault weapons ban during his second term, while further blaming handgun violence in Chicago. President Obama then reiterated his support for that renewed assault weapons ban following the tragic Connecticut school shooting, knowing the dazed public would have little memory of his calls for the ban on the campaign trail. Meanwhile, Senator Dianne Feinstein was meeting privately with the ATF prior to the election to discuss the possibilities for new gun control legislation. To enact it, these gun grabbers needed only await the perfect crisis – at the right time to exploit it and gain ground for their unconstitutional policies. Our memory as a society is so short under the current frenzy surrounding the tragic Newtown, Connecticut shootings that many have already forgotten about NBC sports reporter Bob Costas’ very public cries for gun control, though they were very loud. There is also the significant moves towards supporting the United Nation’s controversial Small Arms Treaty that many fear will be used to restrict the Second Amendment, particularly in the areas of import & export. Though negotiations last summer failed, the treaty will be revived for negotiations and is anything but dead. But just as telling as Obama & Co.’s significant actions to undermine the Second Amendment by exploiting tragedy are the are the countless incidents where guns were used to stop crimes altogether, or to stop mass shootings before they got worse, but were never driven into the national spotlight. Generally speaking, these incidents were NOT exploited in the corporate news media despite the fact that they were both dramatic and newsworthy. Just a handful that come to mind include the 65-year-old woman who stopped 5 armed robbers in a jewelry store, the 22-year-old concealed carry permit holder who pulled his weapon on a mall shooter earlier this month without shooting, stopping the killer’s murder rampage and causing him to commit suicide, the 71-year-old concealed carry holder who fired on two armed robbers at an online gaming cafe in Florida and sent them quickly fleeing the scene for their lives. In countless cases across the country, home invaders are shot or stopped by gun owners, including numerous children who’ve used “assault rifles” to stop criminals in their tracks. Robberies at small businesses are routinely stopped by armed employees, owners or even customers, but the cases rarely make big news. The NRA has estimated that firearms are implemented for protection at least two million times a year, stating that “the presence of a firearm, without a shot being fired, prevents crime in many instances.” Gun Owners of America estimate that number at 2.5 million times per year, while the generally anti-gun Clinton Justice Department, who presided over the first Assault Weapons Ban, admitted that at least 1.5 million crimes are stopped per year due to armed citizens. Without argument, guns are controversial tools which have deadly potential when used by humans with that intent. However, self-defense, protection of property and staving off tyrannical government is the very point of bearing arms, guaranteed under the 2nd Amendment. But those who wish to control populations by restricting access to guns (and finalizing a change in the balance of power between illegitimate government and its people) would have you believe that banning firearms will prevent crime and banish evil. Unfortunately, history shows that this is beyond dangerously naive, while academics in the study of Democide have made clear that despotic governments– in the arena with helpless, disarmed populations– are the greatest cause of unnatural death, killing more than 260 million people in the 20th Century alone.